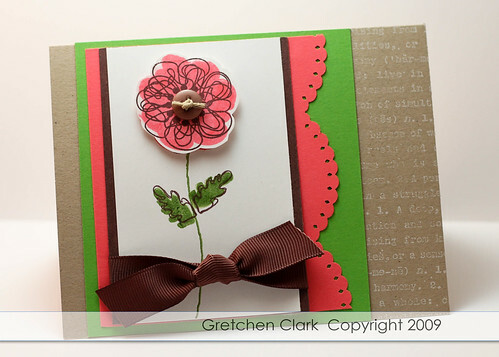 I have another Damask Design card for you today...I hope you are not getting sick of seeing cards with DD :) I promise to ink up a few different stamp sets for next week's posts. I have been super busy with my photography session/editing/etc...that last night I realized I didn't have anything to post for today *gasp*, so whipped this up in a jiff!!! 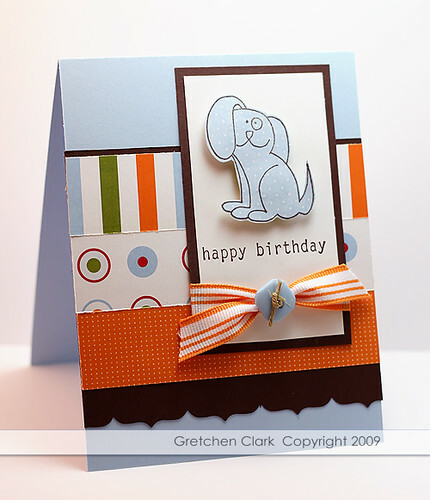 I couldn't leave my blog friends without some paper crafting goodness!!! 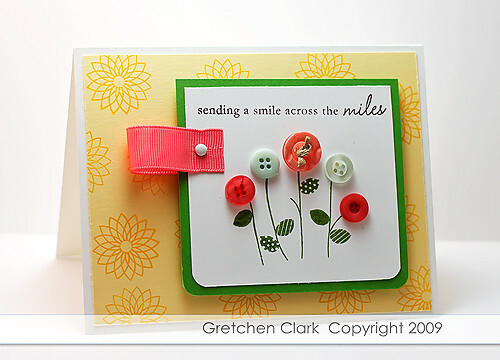 The card came together really fast and could almost be used as a "guy card" (maybe with out the button and ribbon, LOL!). How is your week going? 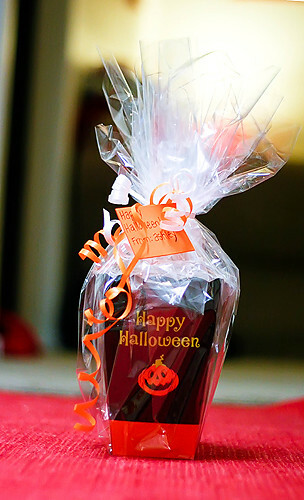 Do you have any plans for Halloween? Mike and I will probably just hang out at home and watch a movie (since our kids are a little old for trick or treating). Thought I would post the treats I made for the office (plus Ashley's treat's too~we work together). 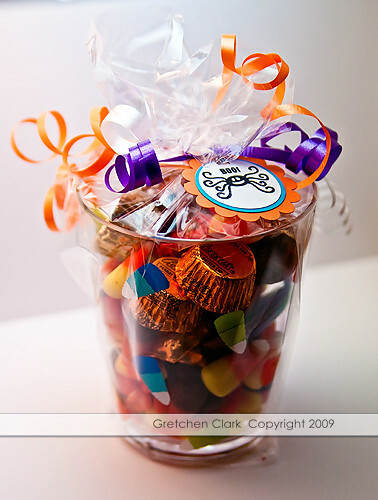 I found these cute cups at Target and filled them with some Halloween candy, tied it up with some curling ribbon and stamped (Halloween stamp set by Recollections) and punched a little tag~easy peasy!!! And my cute daughter who is a little crafty herself...made these for the office :) She also got her supplies at Target. Lots of packaged goodness for today's post. 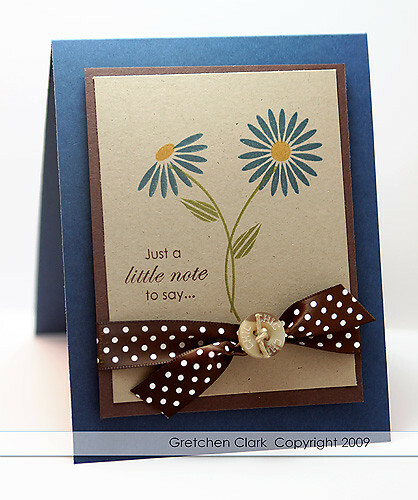 A few weeks ago I submitted 5 cards for an upcoming Stamp It magazine, and 4 were chosen for publication *happy face* This one didn't make it, so thought I would post it on my blog. After I took the photo, I noticed a hair on the card~and I was too lazy to re-take the picture, LOL! Okay...told you it would be a quick post, LOL. I have a busy weekend planned (I need to stop cramming so much into my weekends!!! ), so I will see ya on Monday!!! I finally broke down and bought Damask Designs!!! UPS delivered my order on Monday and I had a few moments to play last night. Not sure I am in love with this particular layout, but it might grow on me. My hubby is in CT this week visiting his family, his mom had a pretty bad fall a few months ago and he flew out to help her out. He told me last night that he was going to clean her house for her today (after almost 24 years of wedded bliss~he is trained pretty well, don't ya think???). He hasn't been back to our hometown in over 8 years, so I am sure he is having a fun time....even if he is freezing, LOL! Happy Friday my blog friends...do you have any thing exciting planned for the weekend? 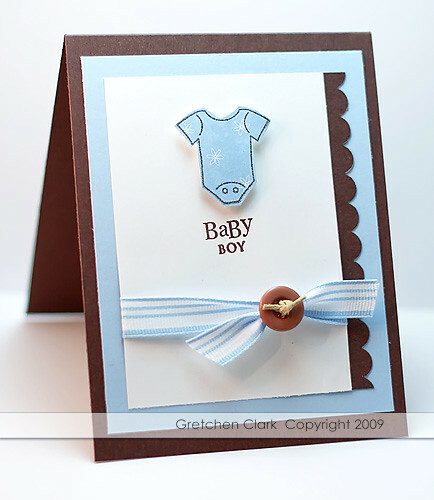 Today I am doing a newborn photo shoot (really excited~hope it goes well, as babies can be a little unpredictable). I also have some Papertrey goodies on the way *woot woot* (didn't order any of the new release stuff yet, because I am still trying to decide). 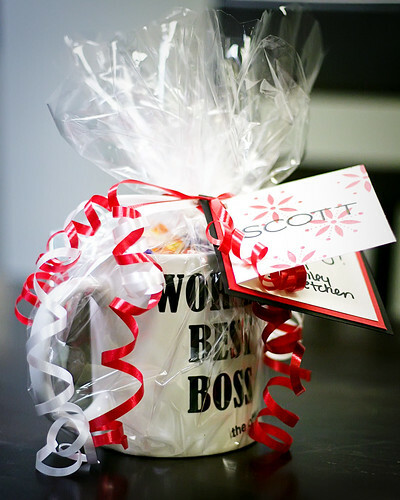 Don't forget to remember your boss today...it is Boss Day...I packaged up my gifts and delivered them to the office last night after everyone had gone home...(since I have today off) and totally forgot to take a picture of them for my blog *sigh* I'll see if Ashley can take a picture with her Blackberry today and email it to me, LOL! Monday...Monday...are you ready for a new week? 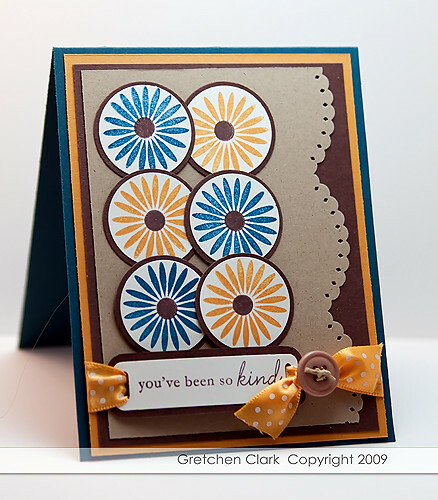 Have you seen the new button stamp set over at Papertrey??? So stinkin' cute!!! That one is def going on my must have list!!! Have you heard of Once a Month Cooking??? I bought this cookbook at Costco the other day because it intrigued me...Ashley and I are going to give it a try to see if we like it. The thought of having a months worth of meals in the freezer really does sound pretty nice!!! (We may start with 2 weeks first~not to overwhelm ourselves, LOL!). We have to set a date to shop/cook...I'll let you know how it goes. Today is gonna be a quickie...lots of stuff to do. 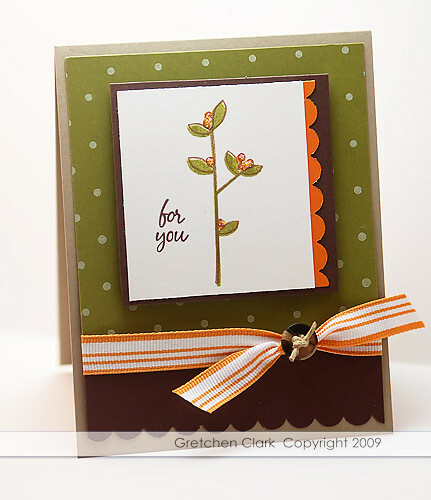 Since the weather has been cooling off a bit here in Arizona and feeling like fall (in the 70's in the morning)...I decided to make a fall'ish card...of course I had to add a button to it, LOL! 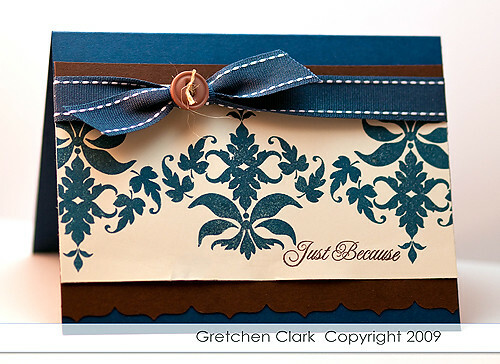 I still have some stamp sets for sale if you are interested...you can see them here. I am going to see this movie tomorrow, with Ashley and another friend...cannot wait~I saw the preview for it a while back and have been waiting anxiously for it...hope I am not disappointed!!! I hope you had a marvelous weekend! Ashley and I went to the movies on Saturday, which is always fun having a girls day out. And Mike and I celebrated Ashley and Nate's one year anniversary with them last night. We ate at this yummy place (I don't even want to know how many WW points I consumed...but it was a LOT!!!). I needed a baby card for a new baby at our church (we have several on the way), I used my Hampton Art set (purchased at Michael's), Oh Baby. 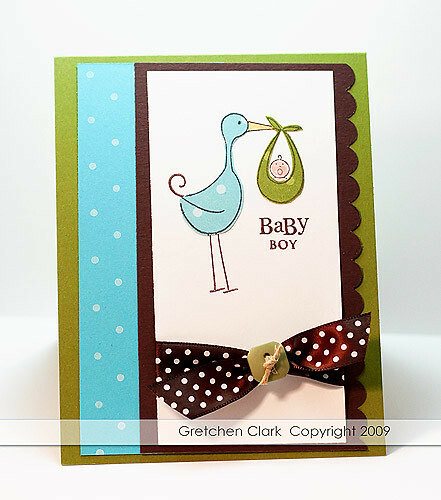 Of course I paper pieced the stork to match the polka dotted cardstock. I even pulled out my markers to color the baby. I mentioned last week that I was going to go through my stamp sets and put them up for sale on EBay. I thought I would offer them here on my blog first and next week list them with EBay. If you are interested in purchasing any, please email me (link in my sidebar). It will be on a first come basis (just to be fair). I listed them with photos on Flickr, and the prices are in the comment section. All stamps are in good to excellent condition and from a smoke free home. I will ship (within the US) with a flat rate envelope or box (depending on amount of stamps purchased), which starts at $4.95. If you are outside the US I will need to weigh the package at the post office and then email you your total. I accept Pay pal (you are responsible for any fees), check or money order. 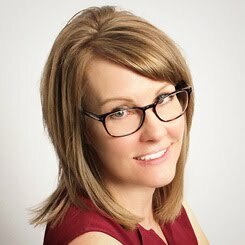 The for sale list is here. Today is my nephew's birthday...Happy Birthday Nathan!!!!! I pulled out my Cornish Heritage Farms stamp set called Cutie Pet-Tootie (I love that name, LOL!) and of course, since I don't really like how my marker colored images look...I paper pieced (one of my favorite techniques!!). I then popped the doggie up with some pop dots that I purchased recently at Michael's (and these babies really pop up your image!). I am so excited to have the next few days off from work...I don't really have anything planned, but hope to have a few mental health days :) I do plan on going through my SU! sets to sell (and I did get contacted by a few blog readers for my list before I list them on ebay~I should have it ready early this week).